Can I hang USM units on the wall - and if so do USM supply a hanging set? USM Haller units are not suitable for hanging on walls. Therefore, there is no hanging set available. Why is the central partition element perforated? The perforation of the inner walls allows doors and other fixtures to be attached to and from both side. Were no perforations present in the central wall features such as shelves could only be added to one side. I would like to use my Lowboard as a CD rack. 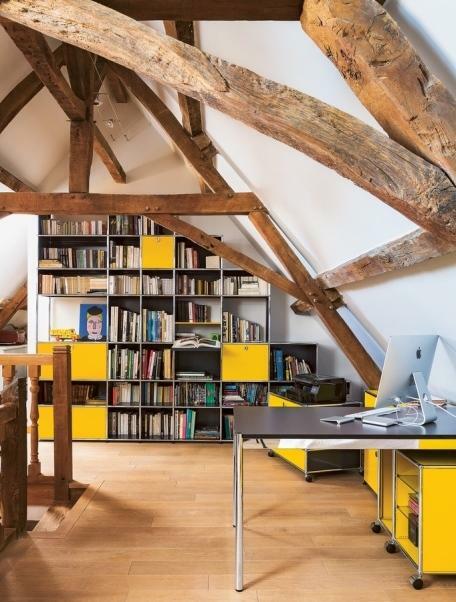 Is it possible to order a Lowboard with the necessary extension shelves? 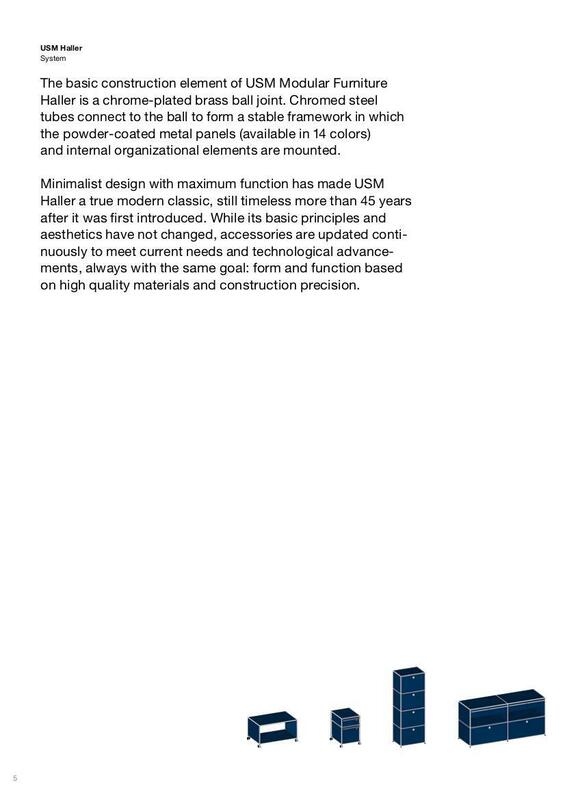 Due to the variety of products offered by the USM Haller it is simply not possible to present all variants on our site. We are however happy to prepare an individual quote for the Lowboard with extension drawers. The required CD inserts can be found here. 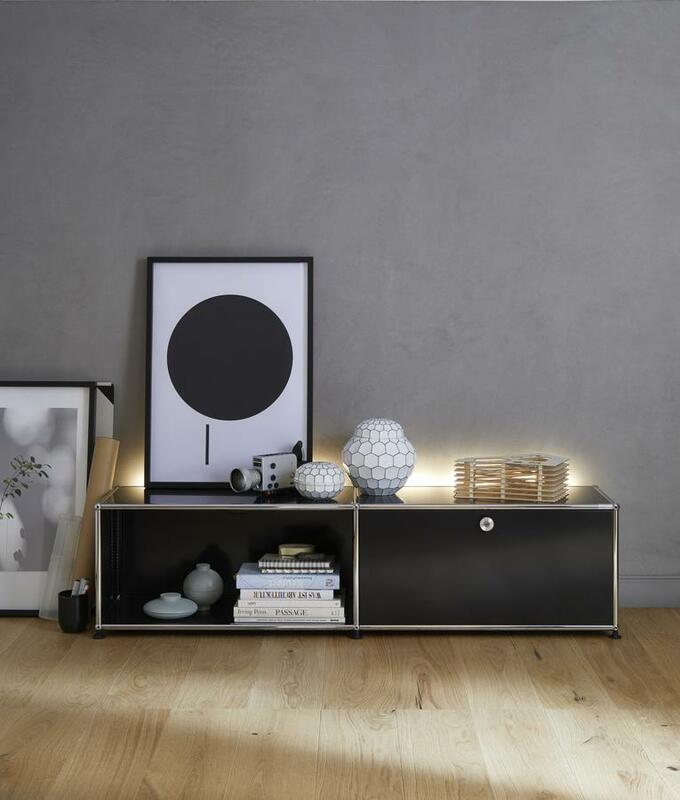 The design of the USM Haller Lowboard L is, as with that of all other USM shelves, based on a very simple principle - metal tubing combined via chrome plated brass balls create a skeleton into which metal shelves or glass elements are placed and act as a a façade. And this intrinsic simplicity is what makes USM such a powerful all-rounder. Using the modular design USM Haller can take on various forms and through offering tailored solutions to any situation perfectly reflects the to the motto "form follows function". A central component of the USM philosophy is that furnishings are not a solid state but an evolving process; as such USM furniture is also suitable for regular reconfiguration. Fritz Haller the designer of the USM system was principally an architect and created the office furniture system as part of a commission for a new USM office pavilion in Münsingen, Switzerland. 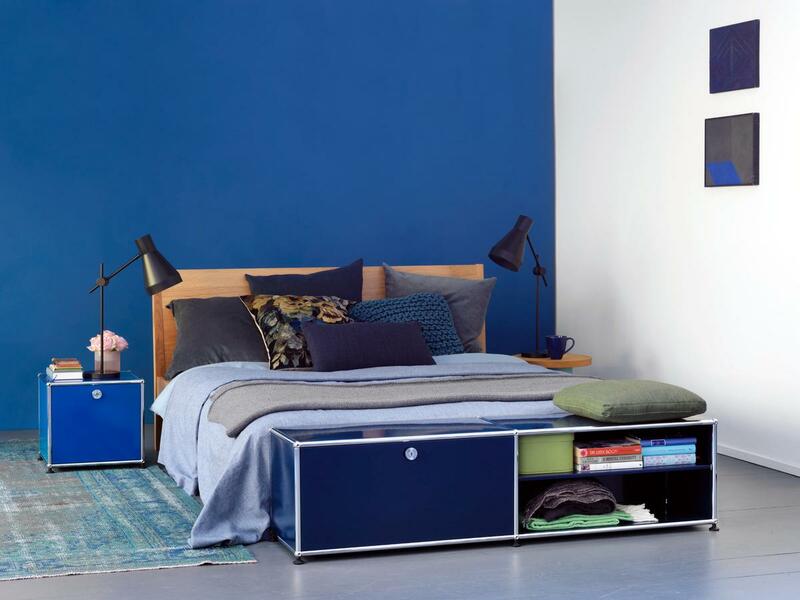 However since 1969 the USM Haller furniture system has been produced in series and has not only become a much loved office furniture system but over the years several has ever more become a regular featuring in domestic environment, particularly as living room and bedroom furniture. 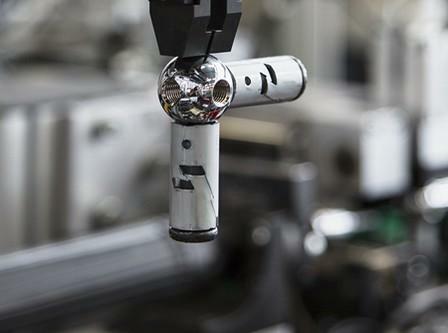 The central element of the USM system: The chrome plated brass ball. 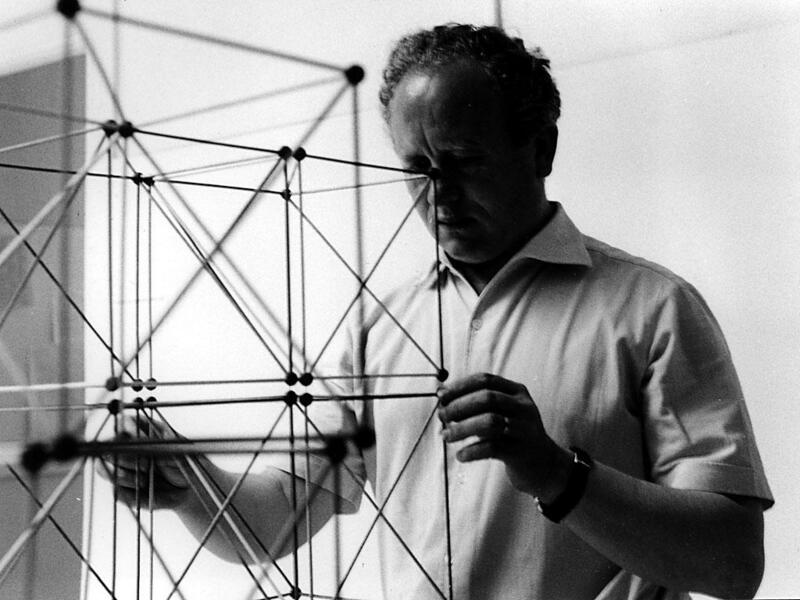 Although Fritz Haller is popularly known for his multi-award winning furniture design, his life's work in principally his architectural work. 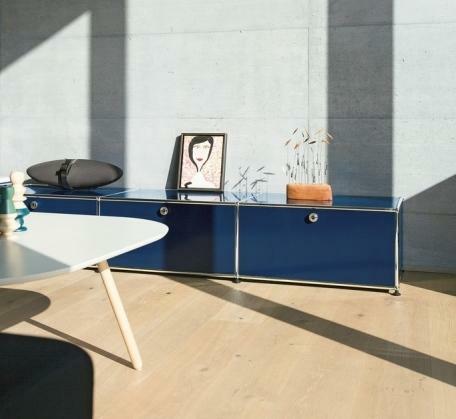 In the course of his carear Haller developed numerous, for all larger scale projects, including schools, office buildings and production facilities; however, his buildings never reached the same popularity acclaim as his USM Haller furniture system. 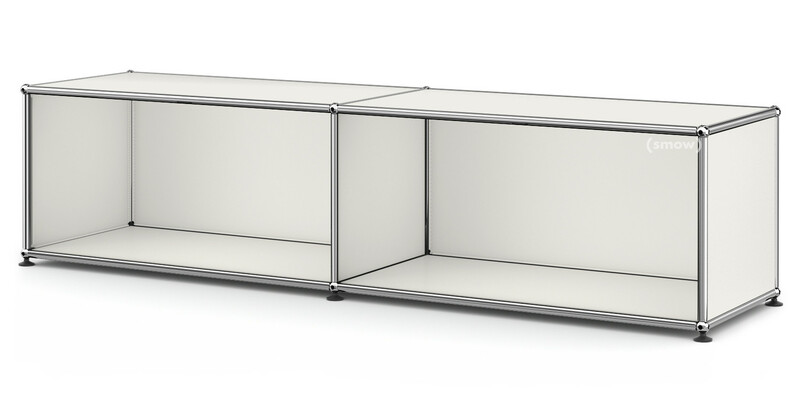 And that although the USM Haller modular furniture system arose directly from his work as an architect. Not only was the USM Haller furniture system designed in context of Haller's new administrative building for USM in Münsingen, but the both the USM Haller furniture system and Haller's buildings share a common orientation to functionalism and a fascination on systematics. 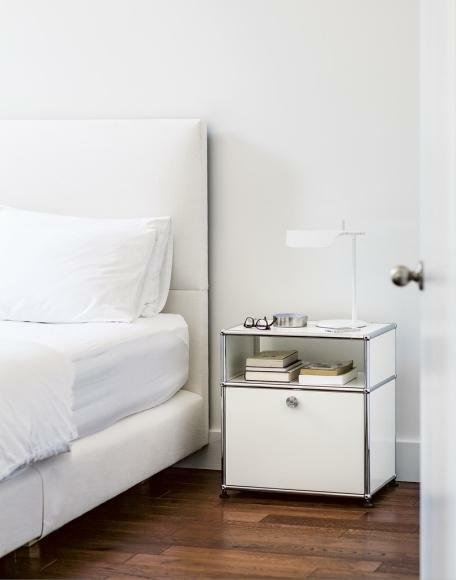 The USM modular furniture system can create a variety of furniture types, including, for example, a minimalist bedside table. The History of the USM furniture systems began in 1885 when Ulrich Schärer founded a hardware and locksmith's business in the village of Münsingen near Bern. Having added the production of window shutters in 1920 and general metal fabrication in 1946 the company underwent its most fateful transition in 1961 when Ulrich Schärer's grandson Paul Schärer commissioned Fritz Haller to construct a new office pavilion in Münsingen, and to design office furniture for said pavilion. Until 1969 the USM Haller units were used exclusively in the USM office pavilion, before increasing interest led the company to begin serial production. Since beginning serial production the system has continuously expanded and developed and today, in addition to the popular USM sideboards and other shelves, tables form an integral part of the range.In 1988 USM modular furniture system was considered as a work of applied art and design thus protected by copyright. The chrome plated brass balls, chrome plated steel tubes and the powder coated metal panels for USM lowboards and other units are produced in Münsingen, Switzerland: the steel panels being powder coated in USM's new powder coated facility at the Münsingen HQ. A new powder coated facility which in its focus on reduced waste generation and resource utilisation perfectly reflects USM's commitment to sustainability and the environmental responsibility of its products and systems. In addition, through its long life cycle and extreme durability USM units, theoretically, need never be replaced; a condition which automatically saves resources. Not producing always being preferable to recycling. As with Fritz Haller's architecture so to is the USM Haller furniture system representative of post-war functionalism. As a design principle functionalism first became prevalent after the First World War with the rise of Bauhaus, and fully evolved after 1945 the become epitome of modern construction. The famous phrase "form follows function" still stands representative of the, then, modern view that the appearance of an object must depend on its function, and not be hidden by ornamentation. This functionalist principle is expressed in USM Haller in a very special way: the modular shelving system not only flexibly designed according to the functional requirements, but can even be subsequently converted should the required function change. 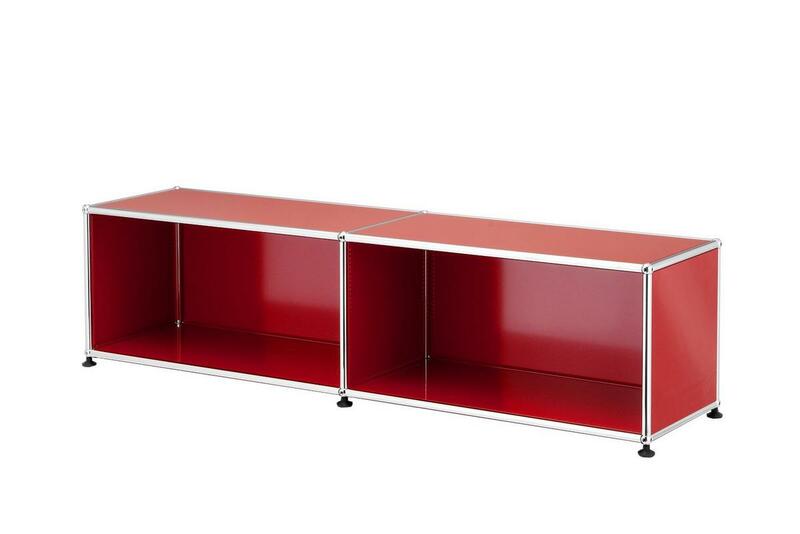 In an art history context USM furniture system, with its strict reduction to basic geometric structures, draws a clear connection to the minimalism of the 1960s. For all minimalist sculpture of the 1960s was based on a schematic clarity, logic, and the presentation of the objects in context of space. Thanks to USM's system character it is suitable for complex storage solutions.